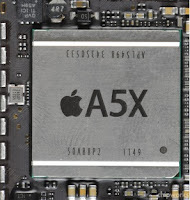 The A5X could it be housed in an upcoming iPhone? Difficult to answer, but several indications that such integration could be complex. And therefore Apple should move on to the successor of the iPhone 4S. Besides the fact that the A5X gets hotter than its predecessor (this aspect is more important on a smartphone where space is much smaller than on a shelf), it takes a lot of space. The A5X occupies an area of 163 mm2 to 120 mm2 against the A5 and 53.3 mm2 for the A4. 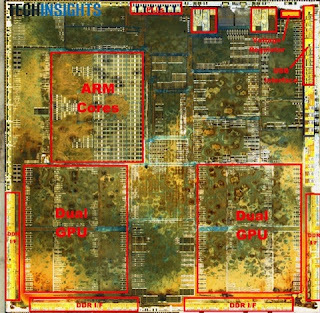 The expansion is due to processor A5X 4 cores of the GPU from Imagination, the PowerVR SGX543MP4. 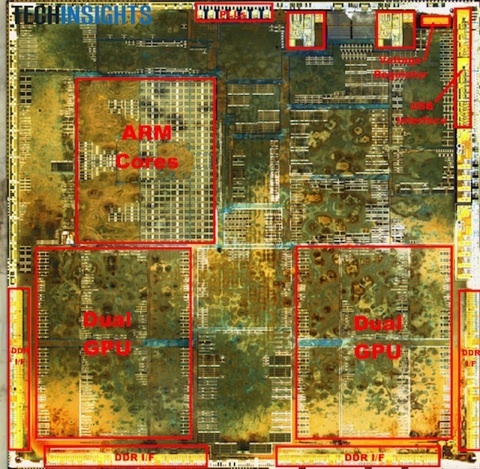 Now the graphics circuits occupy about 25% of the surface of the A5X, against 10% for ARM cores. Other improvements have been made especially in architecture and interfaces for the DDR in order to maximize the potential of the GPU. If A5X displays superior performance to the A5 (read: New iPad: our initial performance tests), it also costs more to produce: $ 23 or almost $ 10 more than its predecessor. iSuppli estimates that the new models are significantly more expensive to produce than their predecessors. 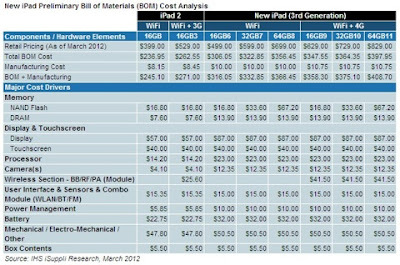 Component cost would be $ 364.35 for an iPad Wi-Fi + 4G 32 GB, or $ 30 more than the iPad 2 WiFi + 3G 32GB at launch. Many components are more expensive. 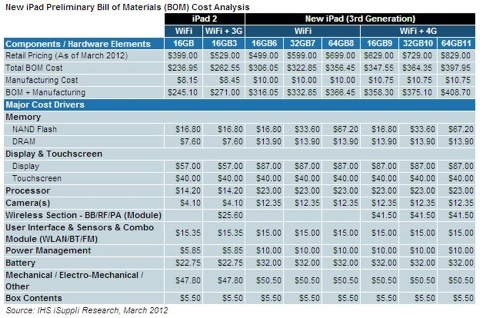 This is the case of the Retina display ($ 87 against $ 57 for the iPad 2), camera ($ 12.35 against $ 4.10), wireless chips, which now support 4G and Bluetooth 4.0 ($ 41 against $ 25) or the battery that costs $ 10 more. But no doubt that with the volumes, Apple will be able to quickly scale economies.